Listen to you carefully to understand your objectives. Answer any questions you might have, and be available for you. Provide information that is important for you. Represent you professionally as your advocate. 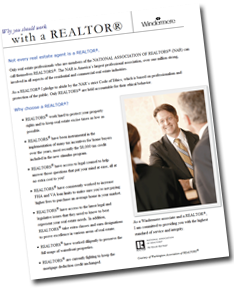 Help you find and purchase the right house. Provide you, the buyer, with important property information and help to narrow the search. Show you listings for sale on an organized tour with you. Notify you of new listings on the market, and about to come on the market.